One of the advantages of using Silverlight as a front-end instead of html/ajax is the ability to create a rich user experience. Our Applications Grid has a lot of advanced features like fast-searching, filtering, sorting, exporting and the ability to perform common tasks. All this comes together to make using AppTracker very fast and simple. AppTracker does a “search as you type” of the applications grid when you use the search box. This search is across all the columns in the grid and is very fast. It can reduce a application list of several thousand applications to only handful in less than a second. The Right Click Menu gives you quick access to some of AppTracker’s most common tasks and also allows for those tasks to be performed in bulk. Archive – Flags an application(s) as Archived, Archived applications do not appear in searches or reports but can be toggled on in the Grid extensions menu to view all of their information. Unarchive – To Unarchive an application(s) first toggle “Show Archived” in the Grid Extensions menu, select the archived applications you need to unarchive and click this option. All columns on the grid show a filter icon beside their name that can be clicked to open. Once open the filter box allows columns to be filtered in a number of ways. You can tick the names you want to directly filter for, you can type in a key word and apply an operator like “Is Equal To”, “Starts With”, “Contains”, etc …. There are around fourteen operators to choose from. It is possible to apply two different operators to the same column; for example it’s possible to filter a column of dates to a specific range using “Grater than Date A and Less than Date B”. You can also filter on more than one column at the same time; all this makes for some very powerful filtering. By dragging a column header up to the grouping area above the grid it possible to group by that column. When the grid is grouped by a column it will add rows to the grid with the title of the column and a count of the applications in the group. Click the image for a bigger view of how this looks. Each group name can be clicked to collapse / expand that group. You can group by more than one column at time and it will form a hierarchical view of the column groups. If you are working with a lot of columns on a restricted view it can be hard to horizontally scroll left or right across the applications grid and still know which application you are looking at. There is very simple solution to this problem, Freeze the columns with the application name. The left hand side of the grid has a vertical bar that can be dragged out and placed at any column on the grid. Now when you horizontally scroll left and right the columns to the left of this freeze bar will not move. This lets you fix the applications name in the view and scroll right to some of the more obscure data and still know which applications you are looking at. AppTracker has a default column order of ID | Name | Vendor | Version etc.. this is good enough for most people but if want to change this order then simply drag the column headers around into an order that suits your working style. To save this new layout select “Configure” from the tool bar and click “Save Grid Layout”, note this will also save the current sort orders and grouped columns. The applications grid is full of useful information and its while its very customisable sometimes you simply need to do something in Excel or maybe email to another person. For these scenarios it is possible to export the applications grid to Excel and a some other standard formats. 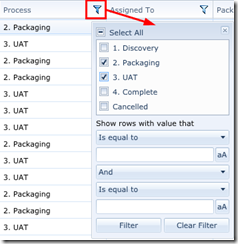 It is easy to sort a column from A-Z or Z-A by clicking on the column header. It is also possible to do more advanced sorting by holding down the “Shift” key and clicking on the header of a number columns and sort by each column in turn.